We don’t eat out very often but when we do, we’re very picky. One of my favorite places for a quick, fresh meal is Panera Bread. Panera makes wonderful salads and soups, and of course, lots of lovely bread. That’s where I got the inspiration for this Mediterranean Sandwich on Tomato Basil Focaccia. I’ve been trying to come up with a tomato sandwich bread but for some reason it doesn’t seem to click. The whole wheat is fighting with the tomato and the savory aspects aren’t coming through. After a couple of edible (but not blogable) loaves, I thought I’d try a focaccia round instead. Bingo – the tomato and basil flavors are very happy now! Focaccia is a very simple yeast bread often made in 13×9″ pans and cut into squares. I wanted to make a thicker round to use for sandwiches so these were baked in 8″ round cake pans. While experimenting with tomato bread recipes I tried canned tomatoes and fresh but found tomato paste yields the best results. Tomato paste is concentrated so the color and flavors are there without being watered down. I loaded up on the fresh basil too – yum! 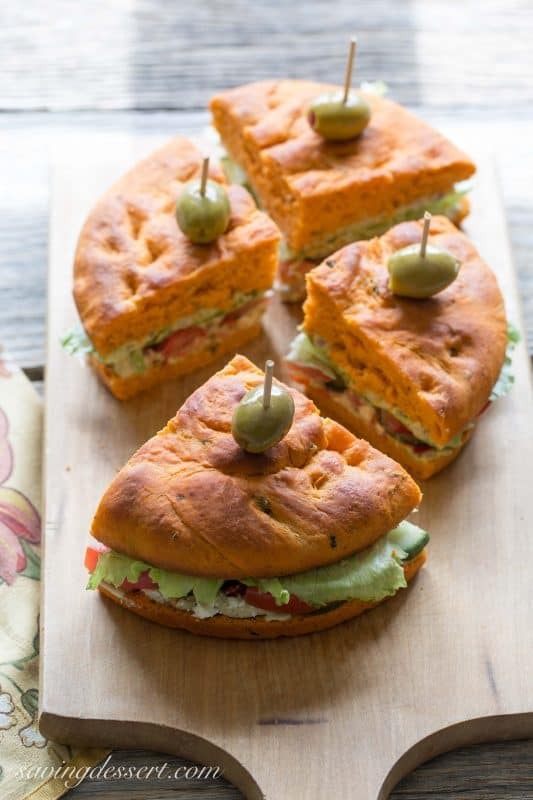 This focaccia makes a wonderful sandwich too! Layered with homemade spicy jalapeño cilantro hummus, tomatoes (you can never have too many tomatoes) cucumbers, sliced red onion, diced peppedews, lettuce and Feta cheese. I believe this qualifies as a Meatless-Monday dinner! My husband and I both loved this sandwich. We also loved the jalapeño cilantro hummus so that recipe will post later this week. I hope you’ll come back and check it out. 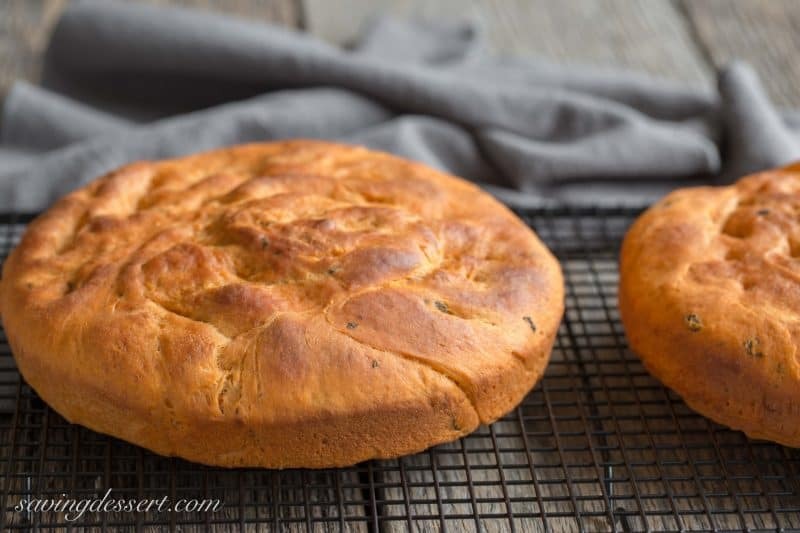 A richly flavored focaccia with tomato and basil baked in 8" rounds for a thicker loaf. 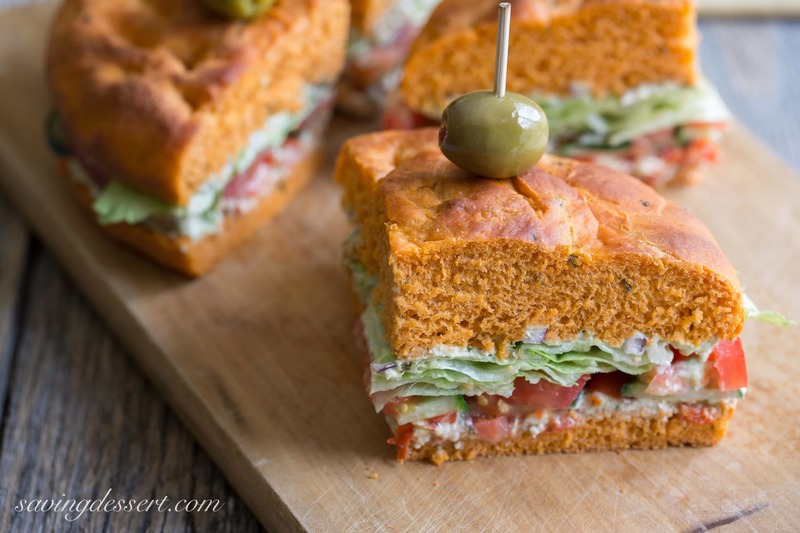 Layered with jalapeño cilantro hummus, lettuce, onions, Peppedews, tomato and feta cheese - this sandwich is unique and flavorful - in a good way! In the bowl of a stand mixer fitted with the dough hook, combine the water, honey and yeast. Stir gently to combine. Let the mixture rest until the yeast blooms and bubbles form on top, about 10 minutes. Add 3 cups of the flour, 1/4 cup of olive oil, the chopped basil, tomato paste and kosher salt. Mix on low until the ingredients are combined. Turn the mixer on medium and continue to blend until the dough is smooth, about 4-5 minutes. Add another 1/2 cup of the flour and blend until the dough pulls away from the side of the bowl. Add the remaining 1/2 cup of flour if needed, 1/4 cup at a time. The dough will be a little sticky but that's okay. Place the dough in a lightly oiled bowl and cover with plastic wrap or a kitchen towel. Let the dough rest in a warm, draft-free location until doubled in size, about 1 hour. Remove the dough from the bowl and cut in half. Press the dough into two lightly oiled 8" cake pans. Using your fingers, poke holes in the dough then drizzle with the remaining 2 tablespoons olive oil, one on each round. Let the focaccia rest again until the dough becomes puffy, about 20 minutes. Bake for 20 minutes or until the loaves are lightly browned. Remove from the pans and cool on a wire rack. For the sandwiches, cut one loaf in half horizontally. Spread the hummus on both of the cut sides, then layer with the remaining sandwich ingredients. Slice the loaf into forths and serve immediately. Another weekend has flown by! I hope you’ll stop by later this week to check out our wonderful Jalapeño Cilantro Hummus. It’s a winner and already a favorite in our house. Thanks so much for stopping by! We don’t have Panera, so I’ve never had the pleasure of enjoying their tasty food… but who needs them when there’s a recipe like this! That focaccia looks so good that I’d have a hard time saving any for sandwiches. It would probably get eaten hot right from the oven! That is the trust Veronica! Warm bread is a personal favorite of mine – too bad there are all those pesky carbs because I could eat it three meals a day! Thanks for stopping by! This is my favorite sandwich at Panera. I have bought their bread and made sandwiches myself , but to make my own bread? Hmmmm. I just might have to. Thanks Anne Marie – and thanks for stopping by! Have a great week. Good looking sandwich, love that you baked the focaccia fresh! 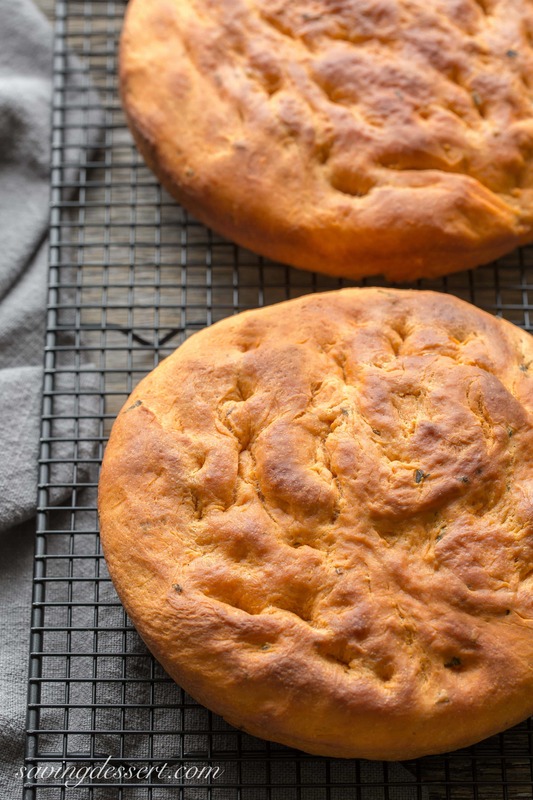 Thank you Dani – focaccia is an easy bread to make – hope you’ll give it a try! 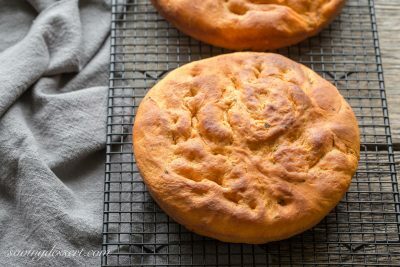 Love the idea of baking focaccia in rounds! Looks so pretty. Don’t you just love the texture of focaccia? So nice. And the flavors you’ve added to it are terrific! Really good stuff — thanks! Thanks John – love a good focaccia too 🙂 Thanks for stopping by! You are too sweet Wendy – so thanks for the kind words! I love Mediterranean sandwiches – so fresh and tasty. Thanks again for stopping by! Your focaccia looks fantastic, what a brilliant idea to add tomato paste. I’m going to pin it and hope to make it later. I can’t wait for the humus recipe. Thanks Gerlinde! The hummus will be posted tomorrow. We’re still enjoying it on everything! Thanks for stopping by! What a brilliant focaccia recipe Tricia. Delicious. What gorgeous focaccia! I think though that you only cook gorgeous food! And tasty food! And i would love to eat it. With you, of course! Thanks Abbe – pretty food just tastes better – haha! You should know since everything you make looks amazing – have a great week! Tricia this focaccia looks incredible! I love the color and the flavors sound great. The idea of making it in the cake pan and slicing it is genius! Since everything I make is gluten-free, and at altitude, the flat version can really be, well, flat. I want to try this! Thanks Toni – hope you’re having a great time grilling! I love focaccia and the use of tomato paste is just genius, Tricia. The sandwich looks beyond delicious. Thanks Angie – the focaccia looks different but tastes great. Thanks for stopping by! Hi Tricia, here in Arizona we have the Wildflower Bakery and Paradise Bakery which I think are really similar, I love, love their salads and sandwiches, this looks wonderful, can’t wait to see your hummus. Thanks Cheri – had more hummus for dinner last night – it is spicy good! Have a great week and thanks for stopping by. Your sandwich looks delectable, Tricia! I love focaccia, but have never made it, so thank you for the great recipe! Thank you Pam – hope you’ve been doing great! Thanks for stopping by. This looks way better than Panera Tricia! Have you thought about opening your own little café? I love everything about this sandwich. Thanks so much Chris! I love baking but not for lots of people – I think I’ll stick with this crowd 🙂 Hope you had a wonderful trip – welcome back! 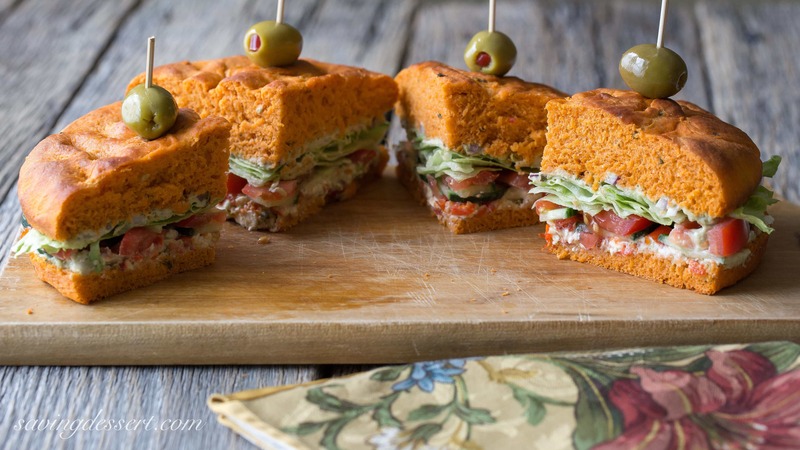 Fabulous sandwiches – that bread sounds incredible…the color is so rich. I bet it would make great croutons! Love everything about this sandwich, from the focaccia to the filling. Isn’t it great to be able to recreate dishes at home to enjoy anytime?! Thanks Jennifer – it sure is tasty! This is just fantastic! 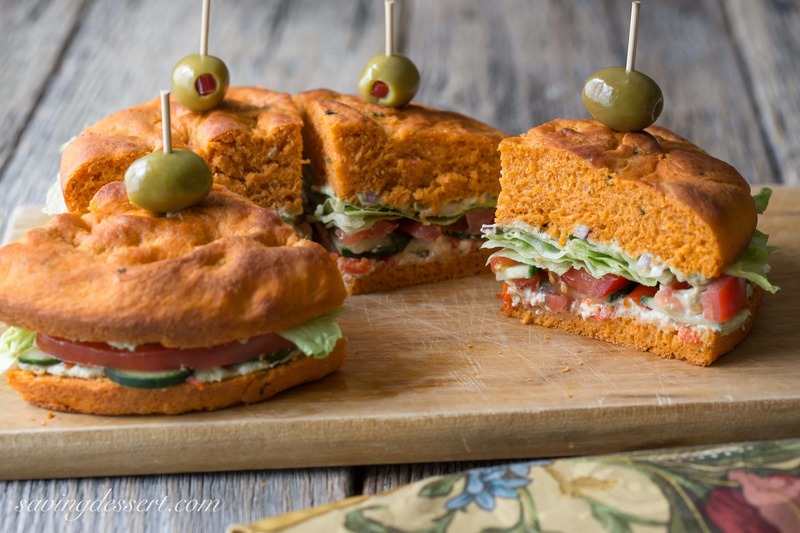 That tomato focaccia looks amazing and such a delicious-looking sandwich! Love that you did all the experiments to get it just right – tomato paste makes perfect sense and I can see the depth of color and picture the intensity of flavor. It’s so nice to be inspired with something you enjoy out and then be able to make an even better version at home. We used to eat out all the time but it’s so different now. I think it’s a good thing. : ) Have a great week! I love when experiments actually work – there are plenty in my “flop” book 🙂 Hope you have a great week too! OMG – the Vegetarian Mediterranean Sandwich at Panera is MY FAVORITE. You have good taste! And your are ambitious…I also made the sandwich at home, but purchased a loaf of the tomato herb bread from Panera. You rock! I’m impressed that you have made your own bread! Thanks Cali – I love it too. You can make this bread – it would be a great one to start with – not difficult at all!